A majority of us are born to lead a routine life, chasing existence. Others more gifted, leave inventions or creations for fellow beings. Yet another category is that of people with a vision. They implement this vision with perseverance and leave their footprints for future generations. M.S. Randhawa belongs to this category. It was the night of India’s freedom after 200 years of British rule. Jawaharlal Nehru was to unfurl the National Flag from the Red Fort in the morning. A man was unfurling the Flag after every one hour the whole night. He was going through the motions, including wrapping the flowers, hoisting it and then unfurling it at the strategic point again and again. He was none other than M.S. Randhawa, the then Deputy Commissioner, Delhi. A perfectionist, he was afraid that something may go wrong and did not want to take any chance since it was an emotional and historic moment for all. This incident symbolises the kind of focus that came to be associated with Randhawa. He was studying in the Khalsa School at Muktsar when his father received a letter in the name of, "Dr. M.S. Randhawa" from the Governor of Punjab. His father was flabbergasted when 12-year-old Mohinder Singh Randhawa told him that he had himself posted this letter because one day a letter like this would come to him. And it did. Only a person with vision and confidence could dream like the 12-year-old did. Born in 1908 to Bachint Kaur and tehsildar Sher Singh, he did his matriculation with science, his favourite subject. He opted for DAV College, Lahore, for his BSc because the Government College was more expensive. However, he did his MSc from Government College Lahore. Randhawa’s selection to the ICS too has an interesting story associated with it. While standing at the window of the college office he happened to go through a form for the ICS exam about which he knew nothing. He was delighted to see the form because he knew all the subjects mentioned. When he asked the office clerk about the importance of ICS, his childhood dream shone in his eyes and he enthusiastically filled the form. He cleared the ICS in the first attempt. He served as Deputy Commissioner at Faizabad, Almora and Sahranpur before he got his cadre changed to Punjab. A forthright and outspoken man, Randhawa’s career as a bureaucrat speaks volumes about his efficiency. When the riots broke out during Partition in Delhi, the then DC Le Belle adopted a very inhuman stance. 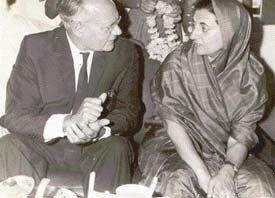 Since Randhawa had already worked with Dr Radhakrishnan, Jawaharlal Nehru and Mahatma Gandhi, his name was suggested as the additional D.C. to balance the acts of Le Belle. On joining, he immediately realised that he had to remove the insecurity from the minds of Muslims. He immediately began meeting Muslim delegations and took steps to ensure an end to bloodshed. Within a short period he brought the situation under control. His role in the riots portrays him as a man of compassion, justice and a true believer of brotherhood among fellow beings. This aspect of his personality comes out of his own diary in which he maintained the minute details of his official life. On his return to Punjab, he discovered there was total chaos over the land left by Muslims. He devised the concept of consolidation of land in Punjab. The refugees from Pakistan were accommodated on this land. After a semblance of normalcy was restored, the Government of India sent him to Geneva to learn about modern agricultural techniques. Unlike bureaucrats for whom trips to foreign countries are either for fun or for self-promotion, Randhawa took his trip to Geneva earnestly. On his return, he laid the foundation of an institution from where a future revolution would take place. He pursued the idea of setting up the Punjab Agricultural University. The first of its kind in the country, it was conceived by Randhawa right down to the last details. At PAU, he set up a museum and art gallery as well to depict the rural life of this region. Ancient agricultural implements, each and every aspect of the rural and folk art and music are all imaginatively displayed at this museum, showing how far ahead of his times he was. 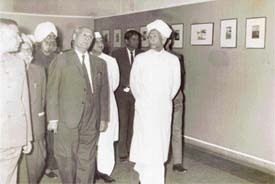 This museum and art gallery was inaugurated by Khushwant Singh in 1973. Yet another feather in Randhawa’s cap was the novel idea of setting up of a library at PAU for the welfare of farmers. This unique library made available all research conducted at the PAU. A bureaucrat, a farmer at heart, Randhawa was also an admirer of the arts. When he travelled to Kangra on horseback, in the course of his official duties, he was the first one to discover Kangra paintings. He bought these paintings from unknown artists and compiled a book called Kangra Paintings. He was the brain behind Roop Lekha, a magazine which published paintings. The well-known art critic W.E. Archer, a friend, guided and helped Randhawa in all his work on Kangra paintings. As the first Commissioner of the Union Territory of Chandigarh, Randhawa played a pivotal role that ensured his place in history. The entire lay out of the landscape and the aboriculture of Chandigarh is his gift to the successive generations. The concept of planting ornamental trees planted in a very systematic manner on both sides of the roads throughout the north of Chandigarh was to provide tree cover and ensure picturesque flowering round the year. If Chandigarh is City Beautiful today, it is solely because Randhawa was so driven by the zeal to plant trees. So much so, he inspected the watering of these plants at 4 am every day. He lived 30 km away from Chandigarh at his farmhouse in Kharar, but reached the city unfailingly at 4 every morning and went from road to road ensuring that all plants were watered and the dead saplings replaced. Today, one has a perfect view of white and golden silver oaks, jacarandas, lagerstormias, mahoganys, amaltas, gulmohars, bauhinias (kachnar), etc. Randhawa gave a green cover of majestic trees like pilkhan and Arjun.It was his vision that enabled a large number of writers, poets, painters and artists to own residential plots in Chandigarh at concessional rates.